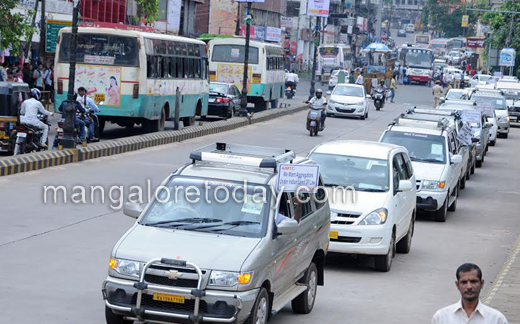 Mangaluru, July 3, 2015 : The state government is cheating the tourist taxi drivers who are paying taxes and earning a livelihood with great difficulty by allowing the Ola cab service to function in the city, alleged BJP leader and former MLC Monappa Bhandary. 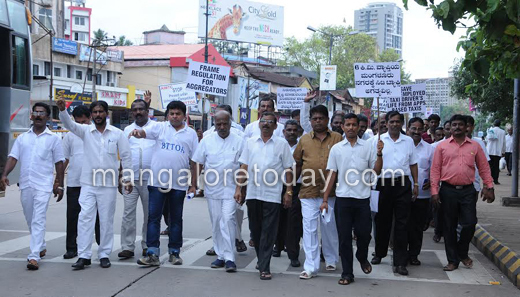 He was addressing a protest organised by the Dakshina Kannada Taximen’s and Maxi Cab Association in front of the DC office in the city on July 3, Friday. 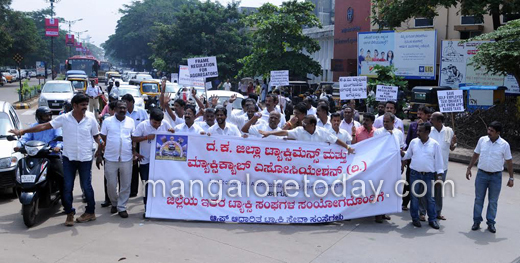 The taxi drivers also took out a protest march from Ambedkar Circle to DC office prior to the protest. 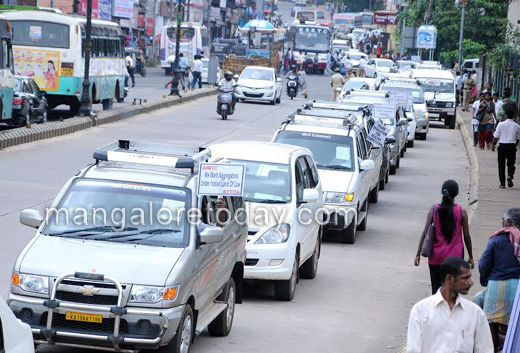 Continuing, Bhandary said the earlier appeals to the authorities regarding the problems faced by taxi drivers due to the operation of the Ola Cabs had yielded no result. GR Shanmugappa, President of State Lorry Owners and Agents Association alleged that taxis under Ola Company fail to follow rules. Ravindra, President of State Tourist Vehicles Owners Association, K Radhakrishna Holla, General Secretary and others were present.